After using Amazon’s top-rated personal blender for 18 straight months, analyzing 20 additional models and then narrowing down to a final seven that we tested over 40 hours, the NutriBullet – Pro 900 Series was our pick for best personal blender. It blended with lightning-fast ease, was fun to use and delivered good value at a sub-$100 price point. The Black & Decker – Fusion Blade is our under-$30 pick. In doing our research, we had to make a decision about where personal blenders ended and where regular blenders began. There are several great blenders out there, but they aren’t “personal”. Bigger blenders tend to offer the ability to blend for much bigger families and also more advanced features like the ability to make hot soup or deliver churn-free ice cream. On the negative, they also tend to be much larger than average, take up a lot of space on your shelf, and run at much higher price points. We define personal blenders as single-serve units that allow you to blend and also consume your smoothie in the same container. Bigger blenders almost always require you pour from a bigger container into a smaller one, and for this reason, are harder to clean, more expensive, and a better model for a cooking professional or family than someone looking for that on-the-go boost with little maintenance and also, less-than-egregious cost. Some of the models we considered had hybrid setups — a blending container that also doubled as a to-go cup, while also including a bigger base for family-sized smoothies. 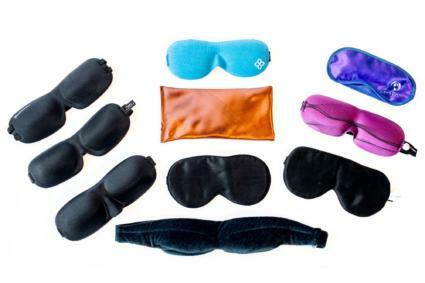 We passed on reviewing most of these options in this round because they didn’t fit the “personal” archetype we aimed for, which most of the time meant little-to-no frills to allow for the most convenience at the lowest cost. However, we did do a test of all blender options in our more general blender review. The exception to this in our blender set was the Vitamix S30, a $300+ blender that received such high marks in the personal blender category that it was worth considering despite containing additional attachments and a bigger price point. Our main tester has owned a Hamilton Beach personal blender for almost two years, and also fits the archetype of the most common personal blender user. That is, they want a good tasting smoothie, but want it fast, and also don’t want have to work too hard for it… or have to work too hard afterward in cleaning it. In addition, nobody in our test group had kids (or additional cooking wants), so there wasn’t much need for a much bigger or fancier blender. 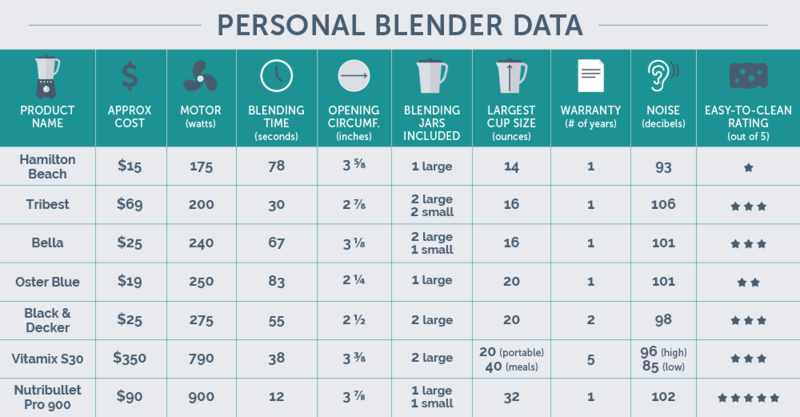 We spent 40+ hours in total researching and testing personal blenders, comparing research from Consumer Reports, CNET, WIRED and more in order to come up with our own criteria and conclusions from a starting point of existing, reputable data sources. We also consulted with two team members with years of experience cooking and contributing to their own cooking blogs, Shef Sherry and Hungry Huy, for their opinions of what makes a personal blender stand out from the pack. In addition to pure blending power, the most obvious attribute of a quality blender, we also tested and indirectly came upon several other differentiating qualities that contributed to a seamless, quality experience… or didn’t. First, the circumference of the blender bottle opening made getting some powders and fruits into the bottle difficult. My scooper for protein would have splashed protein all over my kitchen floor on the Oster Blue or Black & Decker models, which meant I needed to use a spoon, creating more dishes, or waste some of my expensive protein powder down the kitchen sink. A wider opening means getting your favorite ingredients into the glass without a problem. Too wide and you’re impacting on the usability/portability of these bottles. Thankfully, none of the personal blenders really fell in that range. However, some did fall in the difficult-to-pack range, which added some annoyance to the process in terms of additional cleaning or wasted ingredients. The next functionality aspect we looked at before we started blending was actual cup size. While we did want a personal, single-serve blender, we also wanted the option to blend a meal from these blenders… and not just a snack. If you only use personal blenders for a snack or small meal, the Hamilton Beach (14oz cup), Bella (16oz) and Tribest (16oz) models may work for you. In addition to their inability to generate a full meal, smaller cups, on average, made blending more difficult for the motor and caused all three of these models stress when compressing several bigger fruits in a smaller area. Even if you don’t care about making a shake of 16 ounces or more, a bigger cup size is preferable for an improved blending experience. Another characteristic worth thinking about is the sheer size of the blender. One reason people buy single-serve blenders is because they take up little counter space on average. However, this isn’t always true. The Vitamax S30, although high powered, will take up a sizable amount of space in a small kitchen. Comparatively, Hamilton Beach’s inexpensive model takes up very little and would be a worthy companion of any 300 square feet New York apartment. We next looked at the noise levels of each blender. On average, each blender hovered around 100 decibels (dB) when we ran them against an average assortment of ice/frozen fruit and etc using a noise meter. For context, ambient noise is around 45 dB. Tribest’s model screeched to the loudest levels, ringing in at 106 dB, while the expensive and efficient Vitamix came in at an efficient, less noisy 96 dB. In addition, the Vitamix, unlike the other blenders, has a speed setting, which means you can significantly reduce the noise of the blender at lower levels. Blending slower at the 4th level on the Vitamax brought the noise level down to 85 dB. If you don’t want to wake a baby (or a roommate who will cry about it), but you still desperately need your breakfast smoothie, the Vitamix is your best option. 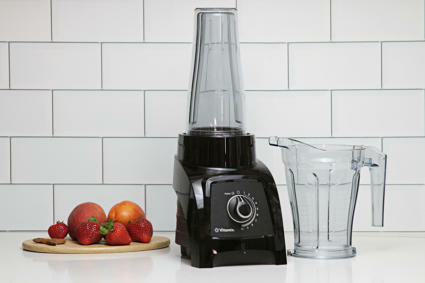 At upwards of $300, the Vitamix S30 is an expensive but high quality blender. Once we had thought through all the main functions, it was time to start measuring blending efficiency. To best control amongst the seven, we used the exact same ingredients in each blender, and put them in in the exact same order against the blade — a pretty normal but fairly difficult test for each blender to run against, with several different ingredient types to challenge it. From there, we timed how long it took to get to an even blend. An even blend was defined as the visual point at which the smoothie reached an even consistency with a single, common color and no uneven chunks. In general, the blenders performed in line with motor power, with the 250 watt and below models, the Oster Blue, Tribest and Hamilton Beach all taking one minute plus to blend the concoction. The Oster Blue technically also required an extra ingredient shake in order to get it to perform, which likely had something to do with its narrow opening contributing to a less-than-optimal blending experience despite being on the highest end in wattage of the lower-end models. Over the long term, this is a common occurrence for lower-wattage blenders. The NutriBullet dominated the competition in terms of time to even blend, managing an impressive even blend time of 12.47 seconds, 18 seconds better than the next-closest result. As mentioned previously, the pure power of the NutriBullet’s 900 watt motor made it not only effective, but fun to use, too. Depending on your want, time to blend might not be overly important. 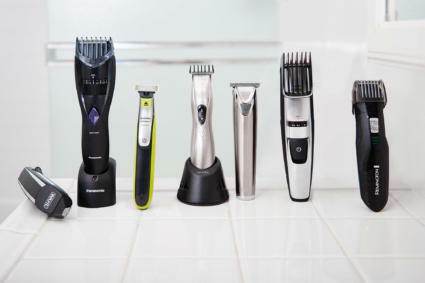 It’s nice to be able to blend in 12 seconds, but if you’ve got a minute, you can live with the Hamilton Beach or Black & Decker models. However, it’s going to be a pretty common occurrence for the Hamilton Beach, Bella and Oster Blue models to struggle out of the gate, which means more than just a slow smoothie — there are also some implications on the durability of the motor, as I’ve had one Hamilton Beach blender break in the past year after wearing it out from repeated uses and struggles to blend. Comparatively, the higher powered motors of the Vitamix and NutriBullet models feel sustainable (and the Vitamix has a five year warranty), so there’s a sense that you are also getting a better investment in the higher end, more powerful motors, too. It’s not totally fair to rate the Vitamix exclusively on blend speed, either — of the models we tested, the Vitamix was the only one with blending speeds and a pulse option, giving you more flexibility in your end product if you’re looking for finesse in your personal blender. My guess, if you’re the typical personal blender user, is that you aren’t, but in case you someday imagine that scenario, it could be something to look into investing in. Finally, once the smoothie is enjoyed, you also have to worry about the fun part — cleaning. The wider mouth personal blenders made this the easiest process, allowing you to clean out the hard-to-get areas of the cup easily and without struggling if you happened to leave it on the table overnight. Comparatively, the Hamilton Beach made it hardest given the blending cup and blending blade fit within the same apparatus, making it difficult to clean hard-to-get-to pieces of the blade if you forget to wash it out immediately. For both cleaning purposes and convenience when building your smoothie, wider mouth openings are superior. When you put everything together, your blender choice comes to a few decision points: budget, use case, and need to have control (or power) when blending. To make comparison easier, we’ve drafted this chart highlighting the main points of our tests in addition to the blender features of the top seven models, so you can make that decision for yourself. 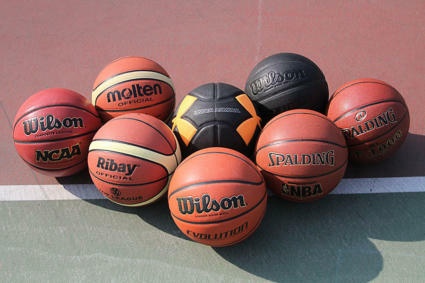 Given we compared so many products, this image might be a little hard on the eyes. Click the image to enlarge and see it full width. The NutriBullet Pro 900 is the best combination of every nice-to-have feature in one package — and at a price much more affordable than the Vitamix S30, which comes in at 3x the cost: $375 to the NutriBullet’s $91 at the time of this writing. A powerhouse blender without the cost, the NutriBullet is our pick for best single-serve option on the market. The bullet’s blending speed, at 12.47 seconds, is almost five times better than the group average of 58 seconds. The power makes blending fun, too — it might not make you healthier by default, but if it’s more enjoyable to do, it may make you more likely to reach for a smoothie than a sandwich. 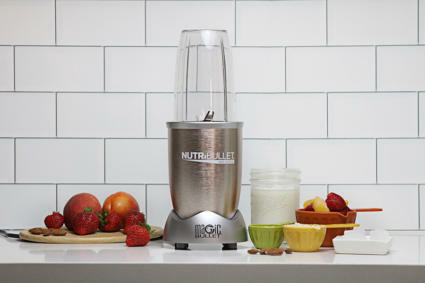 The wide base also makes it easy to make shakes without mess and also clean up without pain. It’s a bit loud, but nothing out of the ordinary for such a powerful blender. If you don’t want to throw down $90+ for a blender, the Black & Decker Fusion Blade is the best bang for your buck, performing solidly at right around $25. Powered by the most powerful motor of the lower cost models at 275 watts, the Black & Decker blended our difficult concoction in just under one minute. 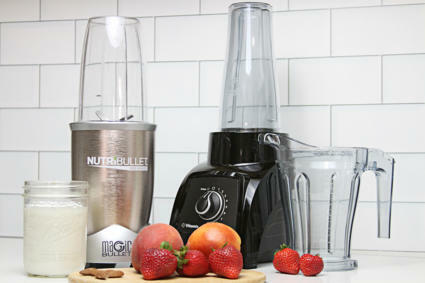 A great all around blender for those who don't want to spend more than $30. In addition, the Black & Decker has a two year limited warranty, a year longer than the rest of the cheaper models. On the downside, its 2 ½ inch opening made making shakes a little bit messier to clean up on average — but that opening shouldn’t be enough to shy you away from a purchase decision if you’re looking for a solid, reliable blender you can use day in and day out. The Vitamix S30 blender was the most expensive model we tested, with an average price of around $350. While the Vitamix performed nicely on every point, very little about it warranted making it an expensive recommendation for the average personal blender user. Unlike the other models, it also has a 40 ounce compact container that makes family blending possible. But if you want a personal blender, you probably don’t care about that use case for the most part. Similarly, it has speed options and also a pulse option, giving you more precision. Yet again, though, that level of precision is rarely needed for the on-the-go smoothie. 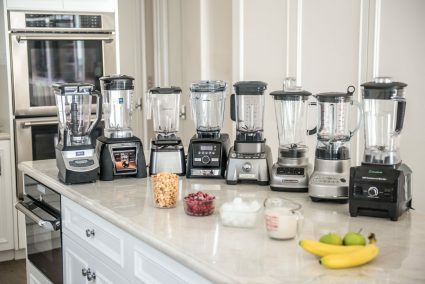 These options also make the Vitamix the biggest personal blender we tested — taking up considerable shelf space, which may come at a premium depending on where you live. The Hamilton Beach personal blender had been a constant in our kitchen for years, and at around $15, it’s great value for the price. You won’t go wrong with a blender like this, but you won’t go right, either. I used it consistently for 18 plus months, and consistently went with my go-to of mixed fruit, protein and maybe a banana. The cheapest model tested, the Hamilton Beach won't bring you any frills, but it can deliver you a shake. Enter these product reviews, and within the first five minutes with the NutriBullet, I realized what the Hamilton Beach was missing: power, fun, and ease. 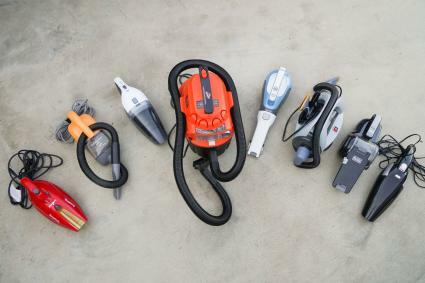 Even compared to its low priced comparable, the Black & Decker, it comes up short in several key areas: motor gusto, cup size, warranty, and ease to clean. 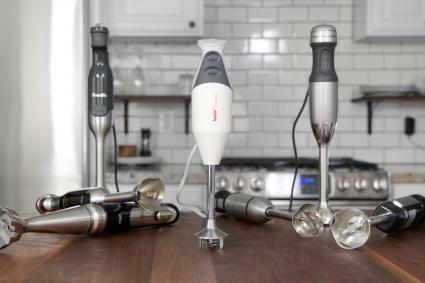 The Tribest blender was one of our least favorite models. It had the second fastest blending speed, but was also priced at $70, had a narrow opening, and was the loudest model we tested. Very little about it seemed to warrant the $70 price point. If it had priced in the $30 range, it might be a different conversation. The Oster Blue was another well-rated, low priced model at right under $20. It had some positive attributes, but it tested at the bottom of our time-to-blend list, taking 83 seconds to fully mix our recipe concoction. The narrow opening/bottle size was a likely contributor, and said size also made the Oster difficult to clean. Bella’s personal blender brought it in the middle of the pack, with a solid blending speed, opening circumference, and ease to clean. However, it was slightly beat by Black & Decker in speed, cup size, and noise level, making it the 2nd best choice in that price range. We originally published this post in July of 2016. Although we had been using personal blenders for years, it was the first time we had used the NutriBullet Pro. 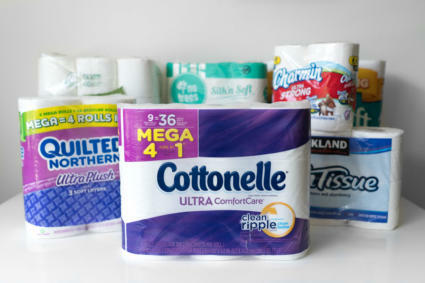 We had read some reviews with concerns about the long-term durability of the product, so were interested to test it on a long timeline to see if we experienced the same problems. Now three years later, we haven’t ran into issues with durability. We’ve been running the NutriBullet almost daily, and are still in love with its power and usability. Cleaning is a synch, it easily blends through difficult mixtures, and there have been no signs of wear and tear. In fact, at one point we started filming a video of the NutriBullet, and because of that, stopped using it daily and instead substituted the Oster. It was a nightmare in comparison, getting clogged almost every single time, causing spills, and in general, clearly showing why he had made the NutriBullet our first choice in this post. 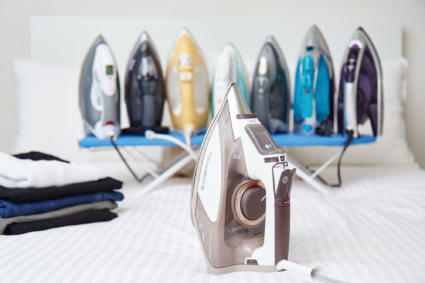 Another member of the Your Best Digs team has been extensively using our under $30 pick, the Black & Decker, and is still happy with the choice. She mentioned having to be cognizant of not overfilling the cup given the units less-impressive motor, but that’s to be expected for a cheaper unit. Overall, we’re still confident in that pick. That said, if the Nutribullet or the other blenders on this list still don’t catch your fancy, we highly suggest you check out our larger blender review for additional blending options. Far exceeding the competition in power, but staying close in price, the NutriBullet is our selection for top personal blender.